Basic morphology of mushrooms, growth patterns and requirements. This work can be related to ecology and nutrient cycling, and lends itself to simple practical experiments. Knowledge of saprophytic mode of nutrition would be useful although not essential. Oyser mushroom 'spawn' (mycelium on sterilised cereal grain). Used with students aged 8–16. 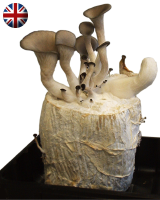 The NCBE supplies oyster mushroom starter culture ('spawn') to schools and colleges in the UK. Similar arrangements may exist in other countries. Some students may be allergic to mushrooms and their spores.